Multiple gadgets offer competing ways to bring music along while you swim, snorkel or shower. 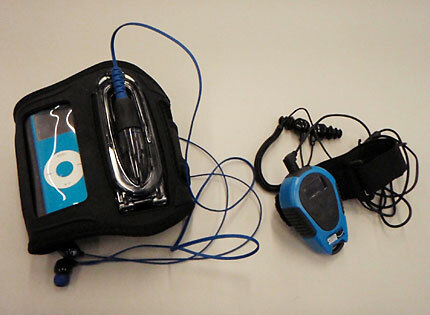 Pick your poison: Either a waterproof MP3 player, or a regular MP3 player shielded with a waterproof case and paired with underwater headphones. We tested both the MP3 player and the waterproof iPod touch case as part of our regular lap-swimming exercise routine. Both work pretty well. We’ve always been skeptical about swimming with music—the sound of splashing water as you flail your arms makes it hard to hear anything at all, never mind lyrics and subtle melodies. But swimming to music was, for the most part, a pleasure—there’s something great about mentally singing along instead of counting laps. The one potential problem has nothing to do with the players themselves, but rather with the headphones—unless they create a perfect seal for your ears, you’re in for some trouble. This is particularly problematic if, like us, earbuds never quite fit you. As water leaked in, we had to adjust the headphones frequently. When this happened, the volume was never steady, and we could sometimes only hear in one ear. This was a problem for both the waterproof case and the waterproof MP3 player. One more thing: Stick to music. At the end of our tests, we became ambitious and tried listening to an audiobook while swimming—has anyone else ever swum to an audio version of Henry James’s Washington Square? While not completely impossible, it was stressful, and attempting to discern the words really made clear the limits of using headphones in a swimming pool. Freestyle Audio Soundwave MP3 player: The Soundwave seems more like one of the 64 MB MP3 players from six years ago than today’s tiny, elegant iPod Shuffles and Zen Stones. Though it has 2 GB of memory, it’s not aesthetically pleasing and is very slow. It’s slow to charge, slow to turn on and off, even slow to adjust volume or switch between tracks. It’s almost as if you’re pushing buttons through a very thick protective layer (which, in effect, you are). So this is not an MP3 player that we’d recommend for landlubbers. But in the pool, it worked well. It was comfortable, reliable and easy to load with music. And though it takes far longer to charge than your typical iPod Touch 2G, it did retain its charge well over a number of weeks. The headphones that came with the player stayed in our ears better than the ones that we had to use with the H2OAudio case (see below). H20Audio Case: H2OAudio makes several underwater cases—we tested the medium-size case with a 3rd generation iPod Nano, though it would work with any similar player. The advantage of such cases is that you can use your pre-existing, preloaded everyday MP3 player without purchasing a special one for the pool. But the advantages end there. Putting on this armband—even for a little iPod Nano—is like going to the doctor to get your blood pressure taken and then keeping that cuff on for an hour. Though we wouldn’t go so far as to say that it slowed us down, it wasn’t comfortable. The manufacturer makes a belt attachment for its armbands, but it looks cumbersome as well, and costs an additional $30. The other major disadvantage of the H2OAudio case is that it basically requires that you use the company’s $60 waterproof headphones—no other earbuds we tried, whether waterproof or land-bound, would work with the seal on the case. We preferred Freestyle Audio’s $15 waterproof headphones (included with the MP3 player) to the H2OAudio’s set. It wasn’t a sound-quality issue—they just stayed in our ears better. Finally, you can spend $120 to make your iPod Touch 2G waterproof, but we still felt like we were putting our precious Nano at risk. We were always double- and triple-checking to make sure that the case was closed all the way. Next to a dedicated underwater audio player, this stress just seemed like an added inconvenience.